This Site Is Dedicated To Sir.Rahul Dravid ,The Legend Of Cricket a player who has gained everything that he wants. My Self Mridul Mittal From Jaipur a Die Hard DRavid Fan . "Dravid Is A Man Who Can Walk on Broken Pieces Of Glass If His Teammates Asked Him To Do So"
India has always produced several great batting legends, and Rahul Dravid is a certainty in the top notches of that list. Despite making his debut almost six years after Tendulkar, he did not take time to catch up with the Master Blaster. By the time Dravid was in his early thirties, he was already in the big league alongside the likes of Sunil Gavaskar, Sachin Tendulkar and other batting greats in terms of run-making ability, ability to play long knocks and consistency. He is considered as one of the most technically sound batsmen of the modern era. A classical stroke player who effortlessly blends substance with style, it is a treat to watch him play those pulls and cover drives. Two traits that are associated most with Dravid are his sincerity and humility. As selfless as he is, he donned the keeping gloves for India when they struggled to find the right team combination. Saving Tests and winning them became second nature to Rahul. Unarguably India's best overseas batsman, Dravid has been the backbone of the Indian batting for almost a decade now. He successfully led his nation to Test series victories in West Indies and England adding to his creditable performances in every country he has toured. 'The Wall' shockingly resigned from captaincy in 2007 after a successful England tour.He was succeeded by MS Dhoni who took the team from strength to strength. Dravid's lack of form in a team bursting with aggressive new talent led to his axing from the 50-over format of the game. A string of poor performances in the Test arena did not help his cause as he repeatedly failed to notch up high scores. But the selectors persisted with him and after 21 innings without a century, Dravid finally got his act together with a hundred in late 2008. He followed that up with four half centuries in six innings on an away tour against New Zealand. Form had returned and this was evident when some brisk knocks from him helped his IPL franchise, Bangalore Royal Challengers reach the finals of the IPL 2009. To balance the experience of the side in the absence of the injured Virender Sehwag, the selectors recalled the in-form Dravid to the ODI side after a two year hiatus for the Champions Trophy 2009. Rahul Dravid is a modern-day cricketing legend. Nicknamed Jammy, Dravid was awarded the Wisden Cricketer of the Year 2000 and is the latest member of the 10,000 run club. The brilliance of Rahul Dravid has steered him to some amazing feats in the cricket world. He is the only batsman in Test history to score a century in every Test-playing nation in the world, the only Indian to score five double hundreds in Tests (three of them in the same season - 2003-04). Rahul Dravid is the only Indian to score three Test double hundreds on foreign soil and the only Indian to score hundreds in four consecutive Test innings. Having played over 100 Tests and more than 300 ODIs, Rahul Dravid is ready game for yet another battle - the IPL Twenty-20 Championship. Rahul Dravid's IPL journey in 2009 was studded with aggressive batting which created the platform for the Royal Challengers to reach the finals and earn a place in the Champions League T-20 Championship. 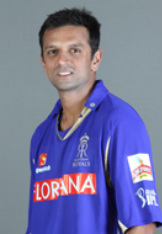 Rahul Dravid is the image of a perfect gentleman on and off the field and is a homely and family person. He is married to Dr. Vijeta Pendharkar, a surgeon from Nagpur and have two sons, Samit, Anvay. Rahul has been one of the main pillars of the Indian batting with his blend of technical roficiency & stylish strokes. His strokes are so perfect technically that he is considered as the "wall" of the Indian Team. His batting style was regarded slow for the ODI’s initially but with his imaginative placing of the ball & innovative strokes he made himself as an integral part of the Indian team for both Tests as well as ODI’s. His temperament for both the versions of the game is exemplary and has earned him respect from all the other players. The Indian Vice Captain has frequently played the sheet anchor role to perfection. . He was verily the batsman of the 1999 World Cup with two hundreds and the highest aggregate. For this, he was named as Wisden cricketer of the year, one of the few Indians to receive this special accolade. His good and innocent looks make him very popular among the girls.